The 2018 Pacific halibut season is set to begin at noon on Saturday, March 24nd, but the U.S. and Canada have failed to reach consensus on limits for the first time since 1990. Both countries have endorsed a quota cut. The IPHC (The International Pacific Halibut Commission) is an intergovernmental organization that was established between Canada and the U. S. in 1923 to monitor and maintain Pacific halibut stocks at sustainable levels. The organization is recommending limits slightly lower than those of 2017. While research indicates a slight decline in stocks, Pacific halibut continue to remain at healthy levels. When an agreement can’t be reached, quotas from the previous year are used until new limits can be set. The U.S. and Canada did agree that catch limits should be lower than the 2017 numbers. Through a domestic Interim Final Rule established by NOAA Fisheries, the U.S. is implementing catch limits that are in line with those proposed at the IPHC board meetings. In 2017, U.S. commercial fisherman harvested approximately 99 percent of their 31.4-million-pound quota. Canadian fishermen brought in 6.3 million pounds, about 97 percent of their quota. U.S. Quotas are split by region. Alaska is divided into several sub-regions. Washington, Oregon, and California have a combined quota of just 1.33 million pounds. 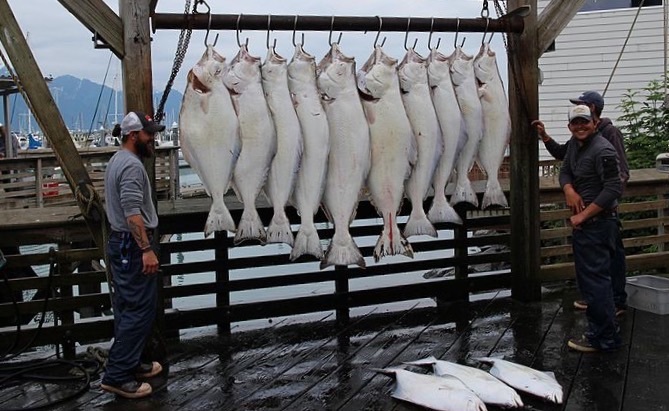 Pacific halibut catch records have been recorded for over one hundred years and range from a total of 30 million pounds in a given year to more than 100 million pounds. Pacific halibut have intrigued fishermen for centuries. They begin life much like other fish, in an upright position with one eye on each side of the head. After they reach approximately one inch in length, the left eye migrates to the right side/top of the head, and the fish glide sideways along the Continental Shelf. They feed on smaller fish and crustaceans and live predominantly in the North Pacific Ocean and the Bering Sea. They can live for over 50 years and have been known to weigh up to 500 pounds. The 2018 season will run through November 7th.